The description for this book could not be further from what this book actually is about. This book has zero to do with revenge and everything to do with finding your own happiness despite sucky circumstances. 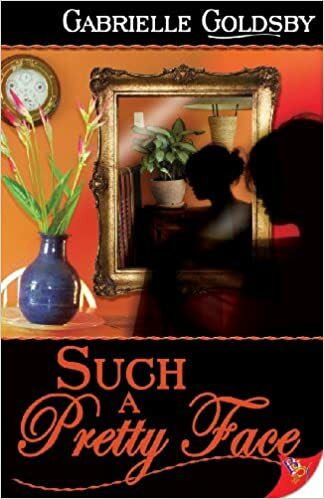 Such a Pretty Face by Gabrielle Goldsby is a light romance that focuses on dealing with dysfunctional relationships (parents, wife, co-workers…) and rising above the nonsense and making the most of your life on your terms. Mia Sanchez a beautiful Mexican American woman who just happens to be plus sized. Mia has a great career, through hard work and dedication she has established herself as one of the top financial analysts in her investment firm. What Mia also has is a superficial wife, a contemptuous mother and to top it all off a growing waistline, none of which she knows what to do about. You see, Mia eats her feelings instead of dealing with her life’s issues. Therefore she overeats, and then begins to avoid looking in mirrors or trying on clothes. Mia comes home one day to her wife, Brenda, who tells her she is taking a job in New Zealand for five months. Three days later, on her way to the airport, Brenda lets her know she isn’t happy anymore and alludes to the fact Mia has let herself go. Damn Brenda, could you be any harsher! Unfortunately, Mia doesn’t breakup with the a-hole, and will have to deal with this relationship when Brenda decides to come back to Portland. Ryan Benson is a beautiful, blond, athletic, construction worker who is the perfect distraction for Mia’s messy breakup, which is more like a strong relationship pause. Ryan is quiet, reserved and undeniably nice. Ryan has personal demons of her own, and she has trouble facing their destructive patterns. Kindness has been a double edged sword for her. These two ladies are almost instantly drawn together but fight the urge to have any relationship beyond friendship because of Brenda and the relationship pause. What I liked about this book is that both of the main characters were not “perfect” physically and they both had their share of emotional issues. I really appreciate that the author gave us a beautiful woman who had a larger figure. Beautiful women do not fit a standard mold. There is going to be a but though. There are things that I did not care for about this book either. The potential is there for this book to be fantastic but (I told you) to me it sadly it fell just short. The narrative, which is shown from Mia’s point of view, spends so much time on her body image, that we lost sight of the romance with Ryan. Ryan’s issues seemed like they were barely touched on and for the life of me I could not figure out why we had to spend so much time with work related issues. There is enough conflict already, let’s delve into the good stuff and forget the petty co-workers. I was desperate to know more about Ryan and what made her tick, especially what drove her to Mia despite all of her reservations. Gabrielle Goldsby is no doubt a talented author, and one who I would gladly read again. I loved what this book was, a pleasant story with refreshing characters.